When applying to a college, you need to prepare a scholarship essay. The requirements for such papers in different colleges may vary but you should do your best to submit a winning essay because it can become a decisive stage for your educational future. The more you work on this paper, the bigger the chances that you will start studying at that college. Writing such a paper requires you to show why you are original, what experience you have, why you want to study at the specific college, and what are your most notable skills. It shows your writing and persuasive skills, and your ability to think critically. To get help in writing such papers, you can use a custom essay writing service. Or you can read this article to succeed! Here are a few scholarship essay tips for those who are applying to a college. They can be helpful if you don’t know how to start writing your academic task or how to choose a good topic and make it convincing. If you strive to get the needed results, you should work hard on your application and essay. Before you start, you should know the specific requirements for such tasks and then, if you do it wisely, it will help you get an education and study subjects you want. There are several types of people who take part in different social activities and help other people. What should you do? It would be great if you present yourself as a person, who has a positive social impact, a professional in your field, a leader that can organize people and lead them into the right direction – you should show that you are not only a good learner but also use your skills in practice. You should always check the grammar in your work before sending it to the college. Bad grammar is not acceptable for student papers so you should think not only about what you are writing about but also on its style and correctness. You shouldn’t copy other texts without proper citation as it can be considered plagiarism and your essay wouldn’t be accepted by the college. When preparing an essay for a scholarship, you should focus on its readers – think about who they are, what they consider a good paper, why they would accept your work and how you can motivate them to accept you, thus, such work also shows your skills to analyze your audience. There are many types of essays so you should use the most appropriate style. If you need to create a scholarship paper, it should be formatted as a scholarship paper – you can read examples of other students who have written their winning scholarship essays to understand how to develop the proper structure for such papers. You should work on each section of your work, starting from the Introduction – it should grab the reader’s attention and make them read the whole thing. You should also develop a proper structure so all the sections of your text will support the idea that you will be a good student for college and also take part in science and social activities of different levels. It’s a common practice to review and rewrite college papers, especially if they are very significant for your future education. Any text would be adjusted throughout the whole writing process. When you’re writing a text for the first time, it can change from what you had originally planned to say. If you’re not sure that your topic or thesis statement sounds good, you can rewrite it many times until you think that it’s good and that it interests other people read your paper. Keywords are the special words and phrases used in your thesis statement. They describe the meaning of your work and its main ideas. Usually, these are the words from the topic and thesis statement. If you use them in your work, it helps readers understand what you are writing about and see that all the sections of your scholarship essay support the thesis statement. Learn more about the college, what are its main trends in learning. You can learn who the students are that are studying there, what do they like, how they differ from other students, and what do for science. It lets you understand which categories of students this college prefers and use your scholarship essay to present yourself as a person from such categories. A good topic is crucial for writing a winning essay. If you’re writing about what is interesting for you, it would be more exciting for you and your readers; essay topics are the first things that the readers see before reading other sections. If you have finished writing your task, don’t be so sure that it’s perfect. Check it for logical and grammar errors, let other people help you with it, because those who didn’t read your paper may notice things that you haven’t noticed while writing. During proofreading, you may find many mistakes that should have been fixed before you send your essay to a college. Thus, proofreading is critical to your success! 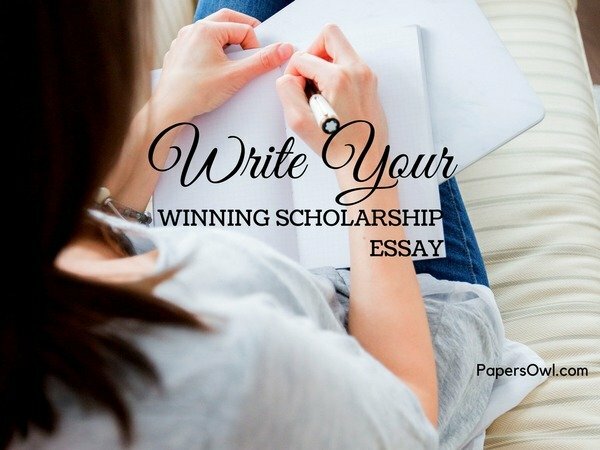 Writing a winning scholarship essay is not an easy task but you can do it well if you use these tips. Don’t forget to consider your audience, who will read your work and ask others to revise and also check your text for grammar. Many students don’t know how to start a scholarship essay or find it difficult. There is a solution for them, as a scholarship essay writing services can do such tasks even in the shortest terms.